Tout Wars Head To Head Archives | TOUT WARS! Jake Ciely Wins Tout Wars Head to Head in 2018! 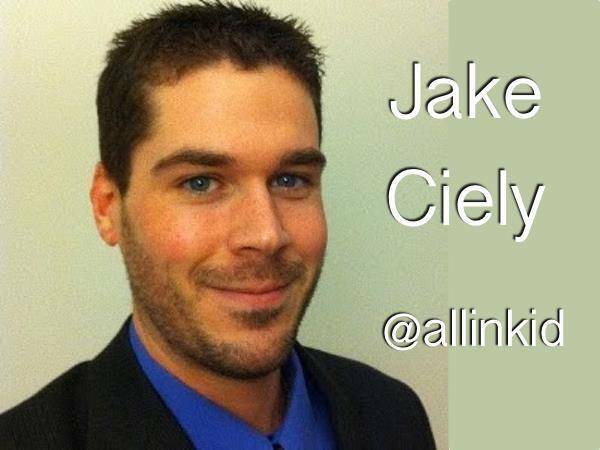 Jake Ciely has been one of the most energetic owners in Tout H2H, talking about the rules and format of the league. 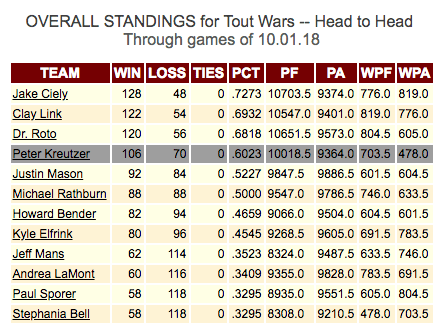 After a couple of years trying experimental hybrids of category based standings as well as points, Tout H2H went full points in 2018, and Jake soared. All the talk after the March auction was about Justin Mason’s pitching heavy strategy, which turned out to be right, but wasn’t as well implemented as Jake’s was. 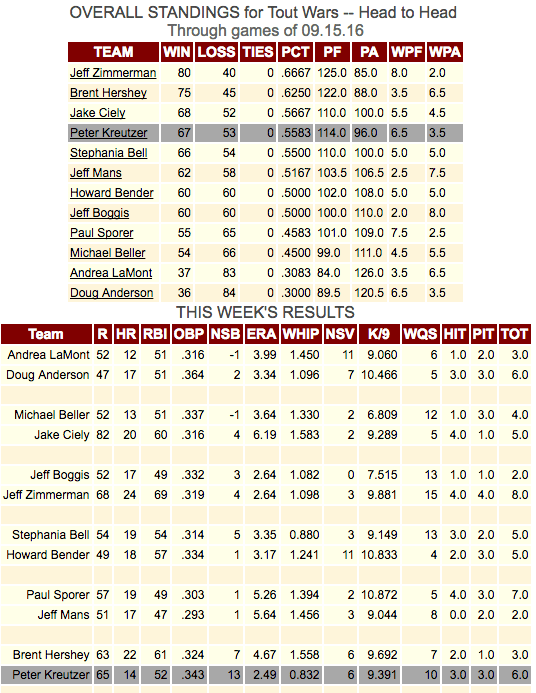 With Monday and Friday roster resets, the game was obviously to load up on quality innings and have a decent offense. Jake’s team did that better than any others. Which makes him the 2018 Tout Wars Champ. Well done. 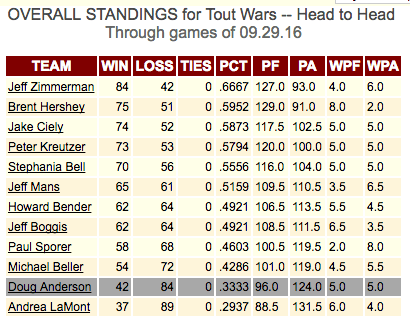 My second year in Tout Wars H2H was a big improvement on the first. The move to a points-based scoring system (from categories), with every out recorded being worth a point, played into my strengths as a player. I’ve found that I am better at finding an edge on the pitching side, and in this format, I was rewarded greatly (more so than in standard 5×5 leagues) for my pitching finds. I finished second, and while it’s sometimes said that second place is “first loser,” I consider this a great accomplishment given the quality of the field. I won six consecutive matchups to close out the season and felt like I really had the league down from a roster-construction standpoint late in the year. Unfortunately for me, by the time I had the pieces in place, it was too late to catch Jake Ciely. 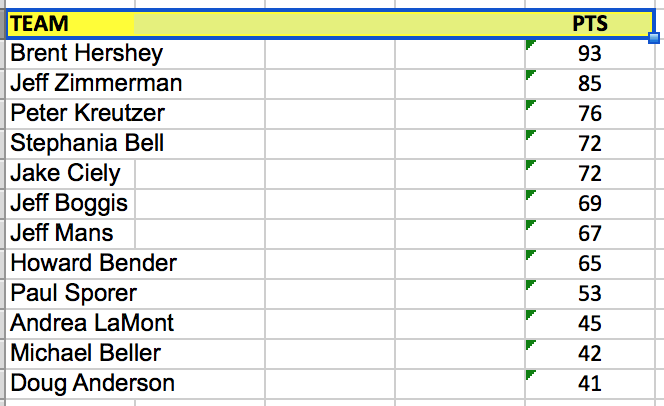 I emerged from the auction and reserve draft with a poorly constructed roster — four hitters on my bench. By the end of the season, I did not have a single hitter on my bench, and I think that’s the way you have to play this 12-team points format. With two lineup periods per week — Monday and Friday lineup submissions — it’s important to just have a slew of arms to rotate into your lineup to maximize points. I learned to treat the waiver wire as my bench for hitters, picking up hitters only when there was a need in my starting lineup. Interestingly, James Shields, who I streamed for only one week, would have ranked 12th on my team in points had I left him in for all of his starts (384 points), highlighting the importance of innings. Busts: Willson Contreras ($11), Nomar Mazara ($11) — not a terrible year for Mazara in standard roto leagues, but he finished with fewer points than Kyle Seager in this format — Luke Weaver ($10), Dinelson Lamet ($5), Scott Kingery ($5). 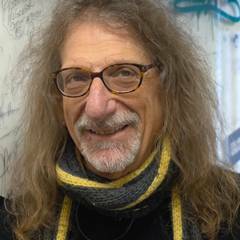 Jeff Zimmerman Wins Tout Wars Head 2 Head! 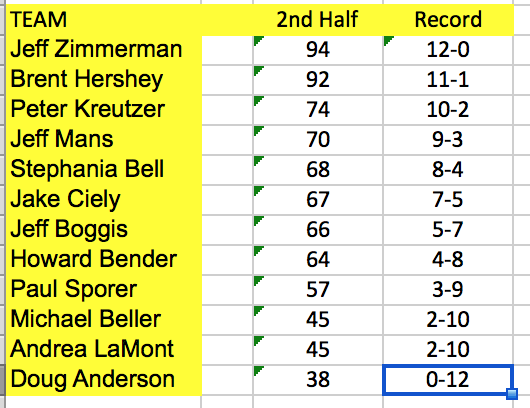 The Tampa-Texas game is not quite over, but there is no way for Andrea LaMont to overtake Jeff Zimmerman in the the pitching categories, so he’s assured a victory (pending the release of official statistics tomorrow) in the league’s first year. We’ll release the official final standings on Monday, after the second half and full year roto standings are calculated and distributed. 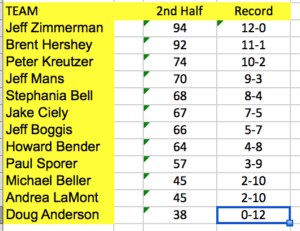 Zimmerman Dominates in Tout Head To Head! 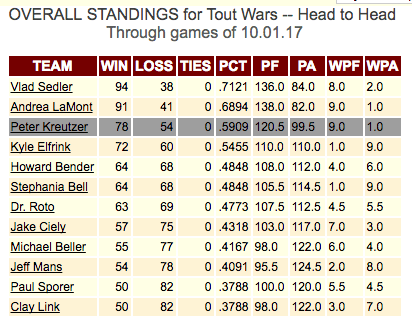 As we draw to the end of the penultimate series of the 2017 Tout Head to Head season, Jeff Zimmerman is soundly beating Jeff Boggis, and is poised to go 6-0 for the week. 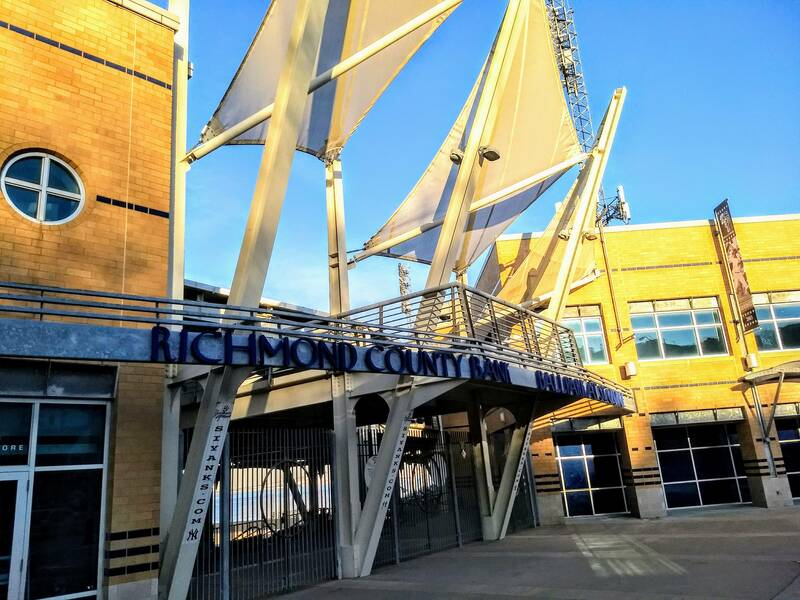 Brent Hershey’s second-place team is being edged by Peter Kreutzer’s team in both hitting and pitching, and is in danger of going 0-6 for the week. But this has been a see saw battle all the way, so there is certainly a fair chance that Hershey’s team will pull it out. There are four days of major league games left to play. Here are the current standings for head to head play. But Tout Daily isn’t just about the head to head. Wins and Losses are also applied based on roto 5×5 standings for the first half, second half, and whole season. 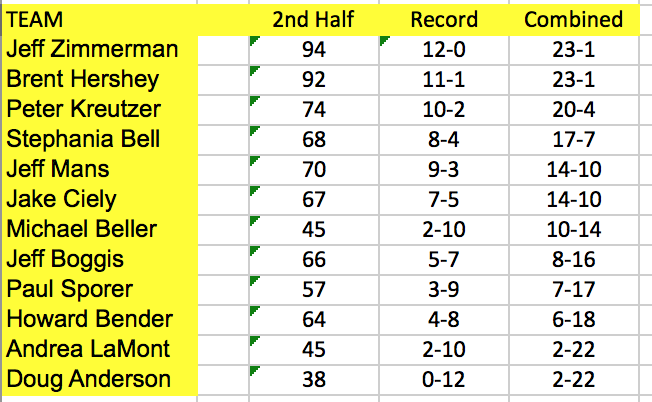 We’ve had a hard time introducing this novel system into the automated scoring our stat service provides, but here are the standings for the various periods to date. We’ll hold off on the end of season standings until the season is over, but it seems pretty clear that there will be no dramatic surprises. The first and second half Top 3 are the same, if slightly resorted. 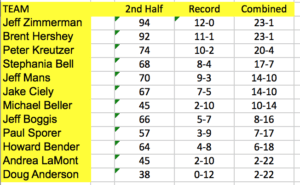 It’s going to take some major reversals for Brent Hershey to overtake Jeff Zimmerman in the race for the first Tout Head to Head crown.